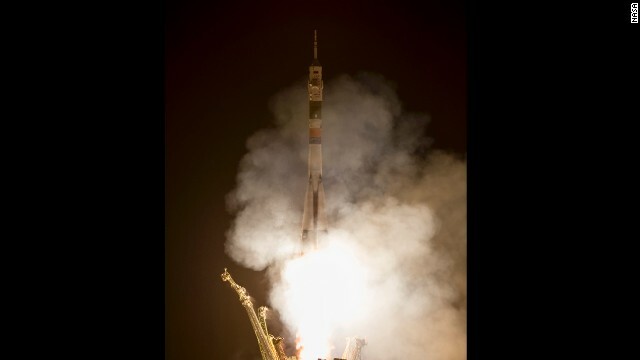 A Russian rocket docked late Tuesday with the International Space Station, bringing two space veterans and a rookie astronaut one step closer to a long stay orbiting the Earth. The three - Russian cosmonaut Fyodor Yurchikhin, American astronaut Karen Nyberg and Italian Luca Parmitano of the European Space Agency - will spend the next six months at the space station until their scheduled departure in mid-November. Scientist have proven most astronauts are gay. Everyone agrees the Apollo missions were faked. No sense calling the actors gay. 'Everyone' being you and your invisible rabbit friend, I take it. Why are we still wasting money on this? We can't take care of problems at home because of funding issue's but we can waste billions on this. For what???? To study effects on things in zero gravity? Since their are no planet's that we can reach is their a point? @USMC1371 what rock are you living under? There are plans for manned missions to other planets. They plan to colonize Mars even if on a small scale. There are some things that can't be done on Earth because of gravity that can be done in space. If this were 1693 you'd be founding the Amish. Individuals are planing a one way mission to mars again whats the point? Until a mission can sustain itself then its nothing more then burning money just to say it was done. Yah we can go ruin another Planet. Hard to take you seriously when you can't spell or use proper grammar. By the way, if you want to complain about space spending you should know that NASA's budget is one half of 1% of the national budget. If you want to talk about wasted billions you should be talking about cutting funding to the USMC.